Map of the Hedjaz Railway Showing extension to Mecca and Jeddah. 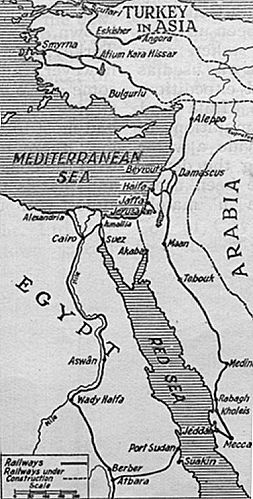 In the recent attempted invasion of Egypt by the Turks across Arabia and the Suez Canal the Hedjaz Railway appears to have been utilised, for if reports given by prisoners taken near Ismailia are true, the station at Seila was used as the detraining point for the ill-fated expedition. Here soldiers were brought from Haifa and Damascus with their stores and munitions of war, such as they were. To provide a water supply for the troops whilst crossing the desert pressed steel boats are said to have been used, which it was ultimately employed in crossing the Canal; these arrangements must surely have been due to Teutonic ingenuity. The Hedjaz Railway is unique insomuch as it was ostensibly constructed to enable Mohammedans to be better able to make pilgrimages to their Holy Cities of Medina and Mecca. Its sacred character appealed to the charitable feelings of the Faithful, and subscriptions poured in for making from all Mohomedan countries. In fact taxes were levied, and in force until quite recently, which were supposed to go towards the construction and equipment of the line. Public advertisements, theatre programmes, etc. had all to bear a revenue stamp of about ½d. Value, which was supposed to go to the funds of this railway, but whether it did or not, or whether the line was secretly subsidised by the Germans is not known, though this tax, as many others in Turkey, was frequently evaded. Recent events however, appear to strengthen the theories some of our military experts advance that strategy, and not religious considerations had most to do with its inception. Be this as it may, there is one very notable fact connected with its construction and equipment of the line, and that is that the material and rolling stock, almost without exception, came from Germany, and engineers from the Fatherland were practically the only foreigners engaged on the work. Train of the Sacred Caravan, Ready to Depart Cadem Station, Hedjaz Railway. The railway is of 3ft 6ins gauge, 1.05 m., and runs from Damascus almost due south to Medina, via Ma’an, Tebuk, etc., whence it is presumed it is carried on to Mecca. Whilst this is fairly certain to be the case it is of course difficult of confirmation, as though German engineers were the guiding influence in connection with the railway, and also many cases other foreigners, such as Greeks, Armenians and the usual Levantines were to some extent employed, even they were not allowed access to the Sacred City, and the line from a certain radius was made and entirely worked by the Turks themselves. In cases where the train is worked to within this district, should there be an ‘Unbeliever’ in charge of the train he is relieved, and a Mohomedan is substituted. However if it is assumed that the railway does actually touch Mecca and go on to Jeddah, a port on the Red Sea almost exactly opposite to Port Soudan, from which the Soudan Railway gives connections to Atbara and Khartoum, this project is certainly very suggestive, as it doubtless provides the best route for an invading force to enter the Soudan. At its northern extremity the line is expected to make a junction with the Baghdad Railway via Aleppo, and so connect with Smyrna and Constantinople. Through running will be out of the question, owing to difference in gauge, the Baghdad and Anatolian Railways being to 4ft 8½in. The disturbed state of Turkey, and lack of funds, have so far prevented the completion of the lines given. First and Second Class Bogie Carriage, Hedjaz Railway. 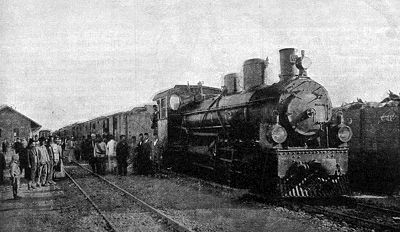 Pilgrims' Train at the New Station, Damascus, Hedjaz Railway. In our 1908 and 1911 volumes we described and illustrated some of the locomotives built in Germany for the railway, and now we produce a photograph of one of the 1 and 11 class carriages and some views of the railway. The car is for main line service; it has end doors only, and accommodates 8 first class and 30 second; it is built with a double roof, somewhat after the old Indian pattern, but has no side sunshades. The automatic vacuum brake is fitted. The view of a train leaving Damascus is interesting as it represents the ‘usual make up of one of the pilgrim trains. There are two baggage vans, five third class, one second, one first and a rear brake and luggage van, ten vehicles in all. The tank engine attached is used for local and shunting purposes. Another illustration shows a train at one of the main line stations with one of the 2-8-0 locomotives, illustrated on page 226 of Vol., 17 at the head. The railway workshops at Cadem are shown in the remaining photograph. These are well equipped with German machinery and tools, and are in fact very up to date, with electrical power. As usual in the Near East, the staff available for working such an establishment, when so largely confined to Mohomedan labour as in the case of the Hedjaz Railway, is not fitted to the modern requirements of the modern workshop, so that much of the equipment is idle or not worked to its fullest efficiency. Cadem Station and Railway Shops, Hedjaz Railway. 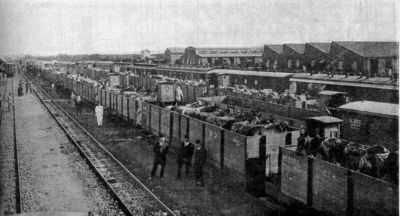 The wagons shown in the view are loaded with horses, presumably for military purposes. The distance by rail from Damascus to Medina is more than 820 miles, and it is 285 miles further across the desert from Medina to Mecca. The principal depots on the line are at Ma’an and Tebuk, 285 and 430 miles respectively from Damascus. El Ula, 609 miles from Damascus, is the last locomotive centre north of Medina, with quite a railway settlement for the staff. Beyond El Ula the infidel is forbidden to go. Some very heavy grades are encountered beyond Tebuk, and Mallet engines are used. Unusually large tenders are fitted to the engines owing to the scarcity of water, which is obtainable at only a few places on the railway. The line as far as Medina was completed in 1908. El Ula station as shown on page 10 of Lawrence's Air Force article.